Continuing to make headlines, AITC announced today that it has been awarded two new contracts to support the United States Army’s Intelligence Center of Excellence (ICoE) in Fort Huachuca, Arizona. The contracts, with a combined Period of Performance (POP) of five years, will focus on the development of Unit Tasks Lists (UTL) and Collective Tasks Lists (CTL) for the Theater Intelligence Brigade (TIB) and other military intelligence units, in support of the Chief of Staff of the Army’s (CSA) Initiative for Assessing and Reporting Training Readiness (ARTR). The TIB contract has four subject matter experts for a one-year data collection period and task analysis effort. The ARTR contract also has four subject matter experts for up to five years and will revise all military intelligence unit collective training tasks, create new tasks as required to comply with collective task standards and business rules established by the Chief of Staff of the Army. 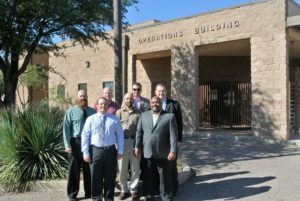 This effort is being implemented with AITC’s strategic partner, Intelligence, Communications and Engineering (ICE), Inc., located in Sierra Vista, AZ. The work will be primarily based at Fort Huachuca, AZ, along with some efforts at the seven TIB’s located both inside and outside the continental U.S.
“Being awarded this contract is another significant achievement for AITC. It continues to boost our reputation as a trusted professional services provider for the federal government. It also translates to more work, program support staff and revenue for our company, spurring more success to our local economy and state. We are continuing to strive for success adding to our contract portfolio, “says Gabe Ruiz, AITC President & CEO. The contracts provide direct support to the U.S. Army’s Training and Doctrine Command (TRADOC) and the ICoE Training Development and Support Program based at Fort Huachuca. The total value of both contracts over five years (if all options exercised) is $3.9 million. “The Army’s intelligence community utilizes the latest technology and equipment, along with highly trained and skilled personnel to develop critical information and make operational decisions. AITC is proud to support this effort to advance the training and skill development that is central to future successful missions,” says Wells Barlow, AITC Business Development Manager. AITC was awarded the contract based on several years of exceptional past performance in a similar capacity. These were part of the 10 new contracts received by AITC in the last two months with a combined value of more than $13 Million, building the company’s momentum after recently announcing the win of the $70 Million Army Medical Simulation Support Services (MS3) contract. AITC team: Mark Ulatowski, Ron Timmer and Alfonso Bodden. ICoE team: James Beyer, James Cox, Robert Guivens and William Todd. The group is pictured out front of the Kelly Operations Building, part of the Intelligence Center and School. It is named in honor of Colonel Robert Kelly, a career intelligence officer who died in a helicopter crash in 1993. He was inducted into the Intelligence Hall of fame in 1996 the same year the building was named in his honor.